Put your ear to the ground and you will hear the cries for "more leaders!" Civic organizations are shriveling and dying because no one wants to be "the leader." City council elections are being won by write-in candidates because no one runs for the office. Work teams are at each other's throats and less-than-productive. The same few people seem to be making all the decisions for the majority. ISU Extension and Outreach Community and Economic Development has an educational program, Developing Dynamic Leaders, that focuses on maximizing the strengths and skills of each individual. This two-part leadership program is highly interactive and guaranteed to bring out the creativity within you. The sessions will make you more valuable in your job, in volunteer groups, and in your community. The need for effective leadership in business, community organizations, and government is greater than ever before. You owe it to yourself to ratchet your leadership skills up a notch or two. The Developing Dynamic Leaders Program is a combination of research-based instruction, proven leadership techniques, dynamic group interaction, and a forum for innovative leadership ideas. The program will provide you with the tools needed to make a difference in your life. Upgrade your leadership skills. Learn new ideas for effective leadership. Share ideas and network with other leaders. Boost your own leadership productivity. Make an important difference in your life. Click here to learn about the classes. Click here to learn about cost and scheduling. Classes are three hours in length and taught by a specialized team of ISU faculty and staff. Participants will receive certificates after completing the Core Skills classes and the Advanced Skills curriculum. Continuing education credits (CEUs) and college credits are available from Iowa State University. Choose 6 sessions from the choices listed and customize the program for your community or organizational leadership development needs. Start with a base of connection to the local community and its issues and opportunities. Hear from local leaders and make connections with them. Leaders in a community need to be “master” relationship builders. Understanding personality differences can enhance relationship building and enhance the ability to coordinate and lead groups. Effective communication is critical to leadership and effective community group work. Examine and practice the skills of effective communication. Session 4: Can’t we just get along? Controversy is normal and expected in community organizations. Leaders need to understand controversy and conflict in order to keep groups together and active. Session 5: Do I have to work with that person? Groups can present difficult situations and behaviors which present challenges to leaders for keeping the group together and on track. Strategies for dealing with typical problem behaviors can help. Every good leader should find effective meeting management to be second nature. 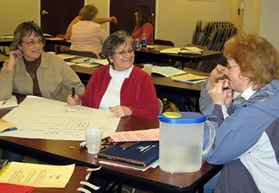 Examine and practice what it takes to plan and conduct effective meetings. Session 7: Do I have to change again? People’s natural reaction to change is to resist. An understanding of what happens when change is presented, and tools for mitigating resistance are important for leaders. Review a real economic development project, from how the community and prospects find one another to the ground breaking and beyond, with a professional in the field. Analyze the role of local leadership. Project review and analysis—what can we learn? Understanding the dynamics of the local community, how to find and engage influentials, identifying and overcoming barriers, building participation and support in the community. Innovation is critical for organizations and communities, yet we think of creativity of the purview of a lucky few or a happy accident. There are learnable techniques that can be applied to challenges and opportunities to generate more and better alternatives. Features of this program include networking and connection to local issues, group or individual work around real project opportunities, and a strong personal skills development emphasis. Typical clients for the program are a community organization on behalf of the community. The client community will identify a target group of participants for whom it wishes to host the program. Approximately $6,000 for a combination of six sessions of your choice for up to 30 participants. Cost includes speakers, notebooks and materials, promotional materials and program brochure, basic refreshments, and registrations managed by the local county Extension office. Other configurations can be arranged, and cost estimates will vary. CEUs can be made available at .3 CEU per session. Cost is $10/person/session. Contact Jane Goeken, one of our Field Specialists. She will ask you to form a local steering committee and to determine program specifics and logistics. Registration is handled through your local County Extension office. Availability varies. At least six months lead time is requested in order to schedule, plan, and market the program.